The Puritans of New England disapproved of Christmas and celebration was outlawed in Boston (1659-81). Virginia and New York, meanwhile, celebrated freely. Christmas fell out of favor after the American Revolution, when it was considered an "English custom". Interest was revived by several short stories by Washington Irving in The Sketch Book of Geoffrey Crayon (1819) and by "Old Christmas" (1850) which depict harmonous warm-hearted holiday traditions Irving claimed to have observed in England. Although some argue that Irving invented the traditions he describes, they were imitated by his American readers. German immigrants and the homecomings of the Civil War helped promote the holiday. Christmas was declared a federal holiday in 1870. Santa Claus is derived from Saint Nicholas, or Sinterklaas, who gave candy to the Dutch children on December 6. Dutch settlers in New York brought this tradition with them. 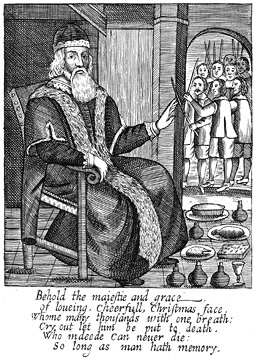 Irving writes of Saint Nicholas "riding over the tops of the trees, in that selfsame waggon wherein he brings his yearly presents to children." The connection between Santa Claus and Christmas was popularized by the poem "A Visit from Saint Nicholas" (1822) by Clement Clarke Moore, which depicts Santa driving a sleigh pulled by reindeer and distributing gifts to children. His image was created by German-American cartoonist Thomas Nast (1840-1902), who drew a new image annually beginning in 1863. By the 1880s, Nast's Santa had evolved into the form we now recognize. The image was standardized by advertisers in the 1920s. Father Christmas is first recorded in the 15th century, but was associated with holiday merrymaking and drunkenness until Victorian Britain remade his image to match that of Santa. Some muslims celebrate Christmas because the religion of Islam regards Jesus as a prophet, messenger and one of the top five human servants of God.